Decided to make a thread because there is an obvious interest in this game by a lot of people but not enough talk about it. Here you can post ideas, strategy, things you would like to see happen, and your th's if you want people to rate them. I'm almost maxed out at TH9. Just need 1 cannon, 1 arch tower, and 1 more tesla to upgrade. My town is anti hog and anti air but sometimes i get 2 starred by GOWIPE. I generally use the GOWIPE method to attack TH10's. I usually get 50-65%. And about 85-100% on TH9's. I suggest you upgrade Golems as fast as you can. They are very nice tanks. Lets see some of your guys's bases. 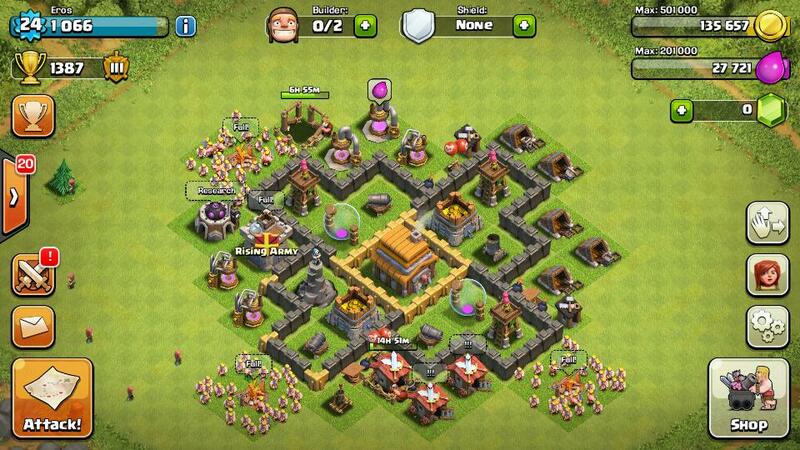 Been using all barbs to attack Farm bases for easy gold and elixir to max walls and upgrades. Well the Barb/Drag event is making it really easy to farm pure barbs and loot like crazy so take advantage of that! I would place your TH on the outside and put the CC in the dead center. also don't forget about your Air Defense, that one also should be placed in the middle. And upgrade it for christ sakes. And I know I need to move the cc to make it harder to lure. Air defense is next upgrade. Edit: can't find a clan worth being in, so my cc is normally empty. In the photo I think I have lvl 1 barbs and a archer? So not worth protecting atm. Oh and why do you only have 2 builders? Don't ever spend gems on anything but builders until you have 5. You should at least have 3 by now. Galaxy S3-5 swipe the screen or hold lock and button on bottom. Just Google your phone type. Mine is holding volume down and power button.